First row: A vector vortex beam that can be decomposed into a vector polarization and a vortex phase. Second row: The vector polarization and the vortex phase can be generated by a q-plate and a spiral phase plate, respectively. A compact device can be constructed by integrating the q-plate structure into the spiral phase plate. Vector vortex beams, possessing both vector polarization and helical phase in beam section, have important implications in laser machining, particle manipulation, and quantum information. Compared with vector beam or vortex beam, the vector vortex beam provides more degrees of freedom in light-matter interaction. A variety of tools, e.g. spatial light modulator, liquid-crystal-based polarization converter, and laser resonator, have been employed to generate vector vortex beams. However, the generated polarization states are usually limited to two special cases: azimuthal polarization and radial polarization. In addition, these methods usually face challenges of low damage threshold, lower conversion efficiency, and enormous size. Therefore, to generate arbitrary vector vortex beams, a flexible generation method with high efficiency and compact structure should be taken into account. 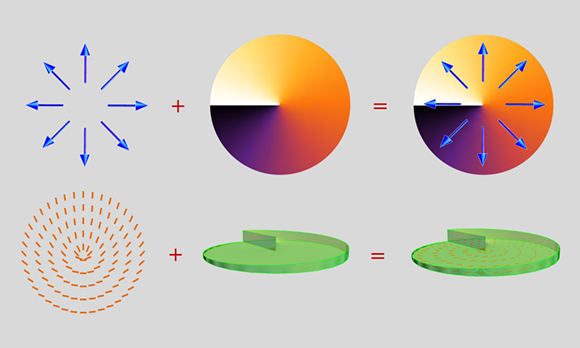 In order to overcome the above problems, spin photonics group led by Prof. Hailu Luo from School of Physics and Electronics, Hunan University, carried out the research of generation of arbitrary vector vortex beams on hybrid-order Poincaré sphere by combining a dielectric q-plate and a spiral phase plate. Related research results are published in Photonics Research, Volume 5, No. 1, 2017 (Z. Liu, et al., Generation of arbitrary vector vortex beams on hybrid-order Poincaré sphere). Vector vortex beams can be mapped on the hybrid-order Poincaré sphere, where the evolution of polarization and phase can be clearly represented. Based on this geometrical representation, a vector vortex beam can be decomposed into a vector beam and a vortex. Therefore their generation can be realized by using a q-plate and a spiral phase plate, respectively. By controlling the polarization state of input beam, any desired vector vortex beam on the corresponding hybrid-order Poincaré sphere can be obtained. Note that the q-plate and the spiral phase plate are both fabricated on silica glasses, suggesting the potential possibility to integrate the two structures on a single plate. Prof. Hailu Luo believes that multiple optical elements with different functions into one glass plate can be integrated. This technique may have potential applications in future photonics and optoelectronics. Further work is to realize the miniaturization of the system by integrating different structures, and enhance the capacity in the manipulation of polarization and phase of light.